It’s hailing. At night. First for me. Off the smallest cell that just went over NE lake Macquarie. Dang. Check water vapour. They growing out of nothing. Enjoy it, it's been a while since we got a high precipitation storm, that I've forgotten what it's like. Yeah Jimi, I didn't walk through it. Lest I ruined my shoes and I didn't want to cut my feet if there was any sharps by waking bare foot. I took the train one station back and walked it home. Worth it. Every. Single. Drop. Of. It. Could be more on your way as well judging by the radar. I have to sleep! I’ve got a 12 hour cook tomorrow. Night! Omg I just noticed that Bankstown got a whopping 67mm from those storms!! That includes 19.4mm in 12 minutes and exactly 30mm in 30 minutes after that. Canterbury got 41mm with that big temp drop as well. 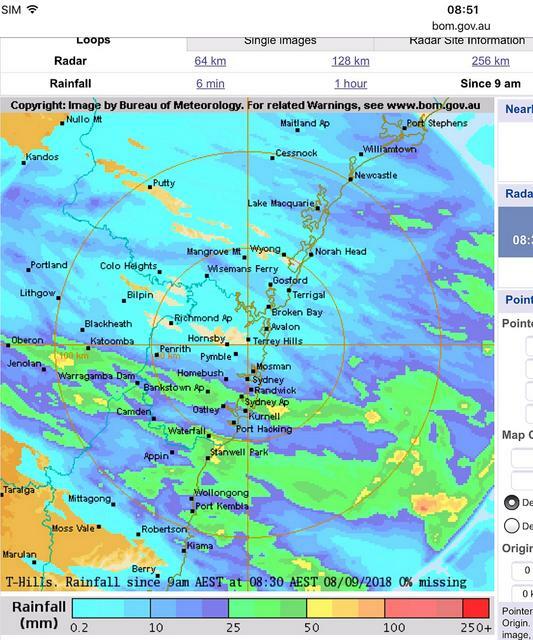 Just shows that 50+ mm was possible, I just expected it in the Hunter, not in Sydney. Out with the SES last night, mostly leaking roofs and flooded yards. Our cats, some of whom were born last November, got the fright of their lives when we had a close lightning strike, and torrential rain. The poor things hadn't ever seen or heard a storm before. Much needed that splendid rain & thunder! There's a patch of 70+ near Jenolan, with a small area of 100+ way out to sea off the Illawarra. Parts of Northern Sydney largely missed out, as did the Putty area, normally a storm magnet. But if you were in one of two strips from Oberon through to Botany Bay, a second further South from the Burragorang area to Stanwell Park, or the Wollongong area and its hinterland, you did very well. Good to see storms about even though the Hunter largely missed out. I would have put money on it that the Hunter would have scored big time in the lead up to yesterdays events. It will be interesting to see what today brings, possibly the chance of a lingering storm. Southerly is well and truly established here with full cloud cover, not overly cold too. 4.8mm to 9am this morning from those thundery showers. Complete turd of a day now. Yep that's what we look forward to... NOT!! An afternoon/evening of storms followed by a few grey days. Often seems to be the way Eddy, but at least tomorrow will be sunny again. The one good thing about days like today in Summer is that they give us some short respite from the heat. Anyway, it's become very dark here with the approaching showers from the west. Some of them could be quite steady/heavy if they make it over the ranges. Could even be some local thunder. Maybe. Still cold too. Just 13.3 degrees currently. Yes that is quite true Homer. Looks like this coming week will be very warm for September, could be a chance for the first 30 degree day of the season on Wednesday for Sydney. Then Thursday and Saturday also look to be high 20's with 30 a possibility. Can't see what Sunday beyond 10am will be like yet on GFS, but there's big blob of very cold air over southern Victoria predicted with 850mb temps down to -4 on Sunday morning. Sunday morning's models suggest that the cold air will slowly edge up from the south so in just over a week's time we might be back into mid-winter territory with potential snow on the CT's. The snow part is unknown at this stage but it's pretty likely that Monday 17th onwards for a few days will be very chilly. I'm happy for winter to hang on as long as possible because summer lasts long enough. Well, it's been solidly grey with persistent light rain or drizzle all day, like some bleak city in the North of England. Chatswood Bowling Club, about a kilometre from here, has not recorded any rain since 9:00, which I find that hard to believe. Maybe they don't check it until 9:00 - too busy bowling. OH hasn't recorded a drop either, but in a Southerly pattern it's often drizzly on the North Shore when it doesn't rain elsewhere in Sydney. Anyway, most recordings in Sydney since 9:00 are under a millimetre. It's just now looking like there might be some clearing. If it's not going to rain properly we might as well have fine weather. Generated in 0.652 seconds in which 0.636 seconds were spent on a total of 14 queries. Zlib compression disabled.